The evening of June 8, 2017 was a fine one at the Collins Library. Artists, friends, librarians, and other interested visitors came for the reception and awards announcements for the 7th annual Puget Sound Book Artists exhibition—Northwest Musings. There was delightful food, gentle harp music and, of course, the 47 beautiful handmade books. Three awards were presented this year: the Curators’ Award, the Collins Memorial Library Award, and the Award of Excellence. All of the jurors who selected the winners mentioned the difficulty of choosing a single work from so many excellent entries. The reasons for each award choice are detailed below. We congratulate the winners and, in fact, all who worked hard to make this exhibit a success. Structure/Medium/Materials: Mache & painted paper on a cardboard armature; Woven paper; Feathers, beads, twig, lichen, duff, wasp paper, ceramic button; Wood board; Book boxes housing post-bound & leather/paper-bound journals. The great diversity of materials, techniques and forms used in the works in this show truly impressed our team of curators. The artists thoughtfully explored the stated theme of the exhibit “Northwest Musings”, calling on their individual memories and their knowledge of history and sense of place to give form to their books. As a team we struggled with choosing our single award winner because there was such a richness of presentations. Ultimately we decided on Patricia Chupa’s work “Thuja Plicata”. It is a complex piece that at first glance evokes the very nature of the Pacific Northwest with the two images of a strong tree and a traditional conical woven rain hat. Both of these images allude to protection, shelter, stability, and Pacific Northwest history. 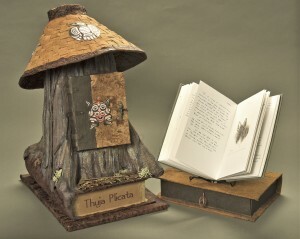 A closer look reveals that it is two small books that are “protected” by the tree and hat, and that each book is a journal containing drawings, personal observations and stories. One journal is actually placed within the tree; the other at a short distance from it. Immediately there is an implied dialogue between the two and a sense that the whole work is a tribute to a cherished relationship. Thus, what is highly personal–the journals– and what is archetypal symbol–Thuja Plicata–merge into one unique book that provides us with a feeling of exploration and discovery. MalPina Chan – 46.79°N 121.74°W: Mapping the Glaciers of Mt. Rainier. Our judges had a hard time choosing, because there were so many beautiful works. The PSBA members are amazingly talented. Our final decision came down to which book was most applicable to classes on the University of Puget Sound campus, and we quickly thought of several specific classes that could use MalPina Chan’s 46.79°N 121.74°W: Mapping the Glaciers of Mt. Rainier. Mapping the Glaciers engages the place and space of Mt. Rainier in the Pacific Northwest landscape and imagination. This book entices the viewer with a Turkish Map Fold construction that opens up to reveal a map and handwriting from Abby Williams Hill. The detail of adding maps to the back side of the folds completes the charm. Mapping the Glaciers is an evocative and inventive representation of one of Washington’s iconic natural features, recognizable by its persistently glaciated peak. Using an old map of the mountain’s glaciers, the artist forces us to address the centrality of the mountain. At the same time, the older map raises questions about climate change in the viewer’s mind: where are the glaciers today? The map itself is framed on both sides with excerpts from the diary of Abby Williams Hill, an artist and progressive thinker who herself was deeply engaged with notions of place and the Mountain. The juxtaposition of map and words from the early twentieth century invites us to explore our own relationship to Mt. Rainier. This work situates its viewer in a variety of ways, through its mingling of topography with the personal writings of Abby Williams Hill, and invites questions about how our experiences with the natural world both shape and are shaped by it. We envision Mapping the Glaciers engaging students and researchers working with the Hill Collection, focusing on our local region, and in courses from multiple disciplines. Hilary Robbeloth, Systems and Discovery Librarian. I have had the wonderful opportunity to view the PSBA juried members’ exhibition over the past seven years and have to say that each year the exhibition has gotten stronger. This year, fine bindings, evocative imagery and sculptural, organic qualities are prevalent in the artist books that are exhibited in the Collins Library. Imagery and meaning is tied in with craft through a variety of scales and diversity of themes related to the Pacific Northwest. Various structures include Turkish map folds, flag accordions, as well as stab–bound, cloth-bound, and piano–hinged books. Imagery is produced through wide means, including photography, stamps, screenprint, digital techniques, and dying. It was very difficult to choose the award of excellence. However, I found myself continuing to go back to a work where the materials were an integrated whole, where form and meaning were united. Suze Woolf’s Pine Beetle Book, Vol III: Bug Ruts is part of her related series of books that reference bug trails in the woods. This shaped book is welcoming, the materials a combination of warm browns. The exposed binding consists of brown threads that wrap around metal pins; threads are left to trail off, echoing the linear trails seen on the felt interior pages. Worry beads are attached to the ends of the threads, which add weight and keep the threads separated. Bug Ruts feels good in the hands. 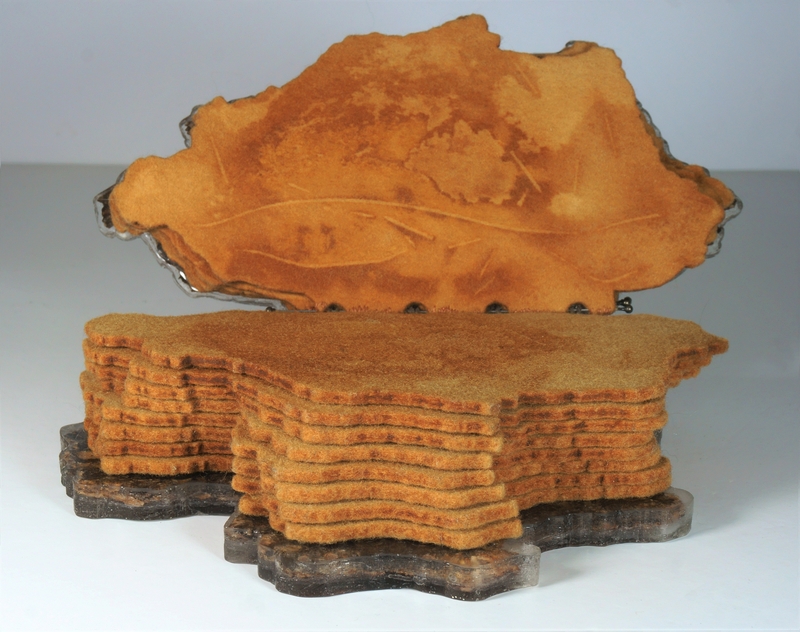 The cover is a piece of organically shaped tree bark that has been bore into by beetles, then covered in clear resin. The uneven resin suggests water or tree sap. On the verso, the rough texture of bark acts as the endsheets, quite visually different than the energetic line veining on the cover. The organic edges of the cover and leafs allow one to wrap their fingers around them, as one might with a worry stone. The shape of the front and back covers differ; in between there is a slow transformation of the shape of the pages, an echo­ of the exterior. Flexible felt pages are contained within the book. Rust dye is used on the soft pages to mark beetles’ tracks. Gestural in quality, these markings are evidence of the insect’s path. The thick pages add a sense of solidity that combines with the softness of the felt material. The pages turn easily. Suze Woolf has preserved the beetle’s journey, capturing a part of the larger whole of our ecosystem. 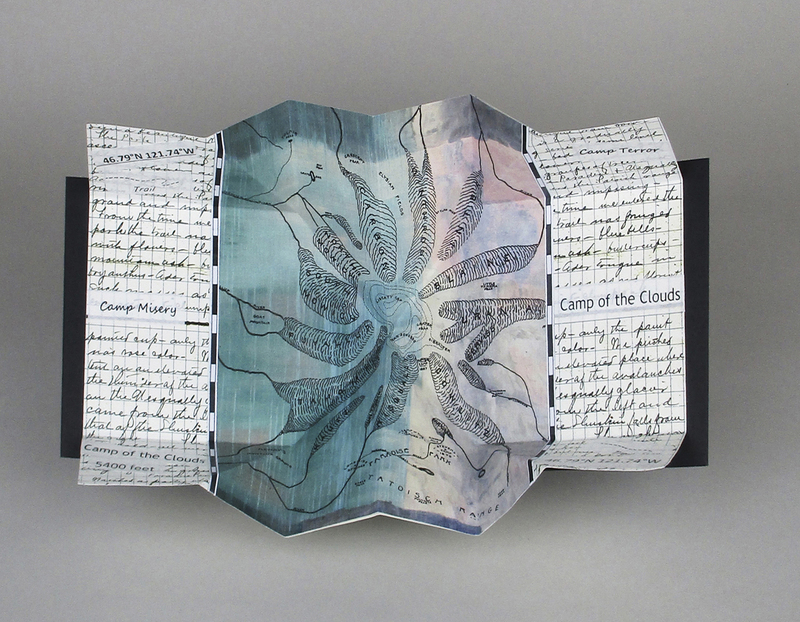 Time, nature, and movement are captured in this satisfying artist book. Featuring 31 artists with 47 unique and original books. The public is invited to attend special, free events that will run alongside the exhibit. All events will be held in Collins Memorial Library. We gratefully give thanks for the continued support and generous hospitality of The University of Puget Sound Collins Memorial Library; particularly Library Director Jane Carlin, graphic designer Jeanne Young, Administrative Coordinator Jamie Spaine, and photographer Ross Mulhausen. This entry was posted in Archived Events, Exhibits. Bookmark the permalink.